I keep trying to create gluten free recipes for my daughter, Spunky. It’s not always easy though. Especially with baked goods. You usually have to use 2 or 3 different non-wheat flours, and add specialty ingredients like xanthan gum, guar gum, gelatin, or agar-agar. And some things just don’t turn out right when you try to convert them using commercial gluten free flours. That’s why I was so happy to discover Bob’s Red Mill Gluten Free 1-to-1 Baking Flour at my local grocery store. My sour cream coffee cake turned out great with it! It really took the guesswork out of converting an old family favorite into a gluten free recipe. I decided to research and learned that there are other brands of cup-for-cup flour replacements out there like King Arthur Flour’s Gluten Free Measure for Measure Flour, or Cup4Cup Gluten Free Multipurpose Flour, but since Bob’s Red Mill is what my local grocery store carries, that’s what I used for this recipe. I’ll have to experiment and test the other brands someday. If you have a favorite cup-for-cup gluten free replacement flour, feel free to try it out with this recipe and then let me know how it turned out. Preheat the oven to 350°F. Grease a 10-inch tube pan or angel food cake pan. Mix streusel ingredients together in a small bowl and set aside. In another bowl, stir flour, baking powder, baking soda, and salt together. With an electric mixer, cream together butter, sugar, and vanilla until fluffy. Beat in flour mixture alternately with sour cream. Spread half the batter in the pan, then sprinkle half the streusel over it. Top with the rest of the batter, and finish with the remaining streusel. Bake for 30-45 minutes or until toothpick inserted in center comes out clean. Cool cake in pan for 10-15 minutes, then loosen from sides of pan with a knife. Remove cake from pan and place topping side up on a serving plate. You can substitute buttermilk or yogurt in place of the sour cream in this recipe. This cake can be made in a 9×13-inch rectangular baking pan. If you prefer to use a 9×13-inch pan, I would just pour all the batter into the pan and then sprinkle all the streusel on top. It’s a pain to make the layers, though it can certainly be done. Just bear in mind that you’ll have to spread the batter really thinly if you want layers. I always think of my daughter, Tissi, when I make this salad. Tissi and a friend of hers were discussing vegetarianism one day and he made her a bet that she couldn’t go without eating meat for more than 2 days. Tissi decided to take him up on it and she won the bet! The funny thing is, while she was trying to be all vegetarian in order to win, she realized she didn’t miss meat at all! So after her 2 days were up, she decided to just go on eating the way she was and she became a vegetarian for real! Has been for a couple of years now. Isn’t that funny? Anyway, when I make this salad and see all the colorful rows of veggies, I always think of my Tissi. You wouldn’t miss meat either when faced with a healthy, delicious salad like this one! That being said, the “Tex-Mex” flavor of this salad makes it a great accompaniment to barbecued meat or chicken. It’s delicious alongside a pulled pork sandwich or some tender slices of smoked beef brisket. Sometimes I add crumbled bacon to it which makes it extra yummy in my book. After all, everything is better with bacon, right? (As you might have guessed, I’m not a vegetarian.) If you’re looking for a heartier, more filling salad that could stand alone as a light lunch or brunch dish, you could toss in some chopped grilled chicken. The dressing for this salad has very little oil which makes it less fattening than other dressings, albeit rather thin. If you want a thicker, creamier dressing, try whisking in a half cup of plain greek yogurt. Place chopped lettuce in a bowl. Arrange remaining ingredients in rows on top of lettuce. Just before serving, drizzle with Cilantro Citrus Vinaigrette. Place cilantro, orange juice, lime juice, honey, cumin, salt and pepper in bowl of food processor or blender and pulse until well-combined. Then gradually stream in the oil while processing until oil is completely incorporated. Dressing is thin and light. My daughter, Spunky, recently went in for some allergy testing at her doctor’s office. The good news is she doesn’t have Celiac Disease, however she does have gluten sensitivity and is allergic to shellfish, wheat, corn, soy, and their by-products, which makes it difficult to find things for her to eat. Seems like there’s wheat, corn, or soy in everything these days! Because of this, I’ve been on the lookout for healthy recipes to try and ingredient substitutions I can make for her. This recipe is a delicious, healthy take on lasagna that’s lower in carbs and gluten-free because it has no pasta. 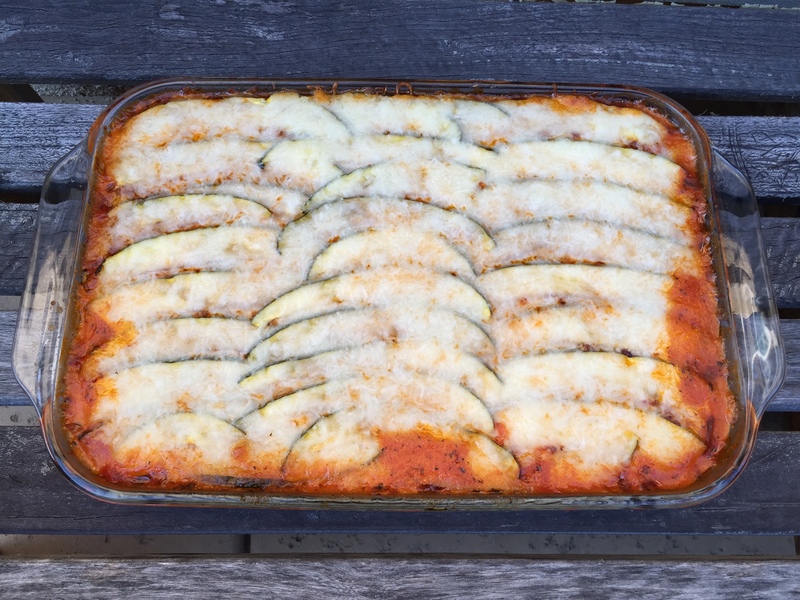 The lasagna noodles are replaced by thinly sliced zucchini. The recipe seems like it has a lot of ingredients but once you get everything you need prepped, it comes together very easily. The fam loves it and they don’t miss the pasta noodles at all! Best of all, Spunky can eat it! Serve this with a salad and you’ve got one satisfying, healthy meal. Oh, one other thing, you could prepare the “meat” sauce up to 5 days in advance and just keep it refrigerated until you’re ready to make your lasagna. Doing that speeds up the prep time which is a big help to a harried cook on a busy week night. Slice zucchini lengthwise into ⅛-inch thick slices. If you have a mandolin, use it! It makes it much easier to get nice, even slices. Place sliced zucchini in a colander, sprinkle with a little salt, tossing it together, then set aside over an empty bowl for at least 20 minutes or more. Zucchini contains a lot of water and salting it removes some of the water. While the zucchini is draining, heat olive oil in a medium saucepot. Sauté garlic and onions until onions begin to turn translucent. Add ground turkey and sauté until turkey is cooked through. Add diced tomatoes, Prego sauce, and Italian seasoning, stirring together well. Let sauce simmer for 30-40 minutes, stirring occasionally. While sauce is simmering, rinse zucchini quickly in cold water to remove the salt, then gently squeeze dry between 3 or 4 layers of paper towels. Spread zucchini on extra paper towels to blot out any excess moisture. In a medium bowl, combine ricotta cheese, cottage cheese, parmesan cheese, basil and egg. On the bottom of a 9×13 pyrex baking dish, spread one-third of the meat sauce. Arrange zucchini slices on top of sauce and top with one-half of ricotta mixture. Do a second layer of one-third meat sauce, zucchini slices, and remaining half of ricotta mixture. Do a third layer with remaining meat sauce, then zucchini slices, but instead of ricotta mixture, top with shredded mozzarella cheese. Bake for 20-25 minutes or until mixture starts to bubble around the edges and cheese melts and begins to brown in spots. Remove from oven and let stand 10-20 minutes before cutting. I was watching Food TV the other day and saw Melissa d’Arabian make kale chips. I had never heard of kale chips before but it sounded good and she made it look so easy. How strange to think that a green leafy vegetable would actually crisp up when baked instead of breaking down and turning to mush. This I had to see for myself! Kale has always been a very popular vegetable in Europe but has only lately started making headlines in the United States. Now you see it on almost every restaurant menu. It’s a good thing because kale is a powerhouse of vitamins and minerals, and has been touted for its cancer protection and cholesterol lowering capabilities. Its leaves are thick and hearty, and stand up well to most styles of cooking. 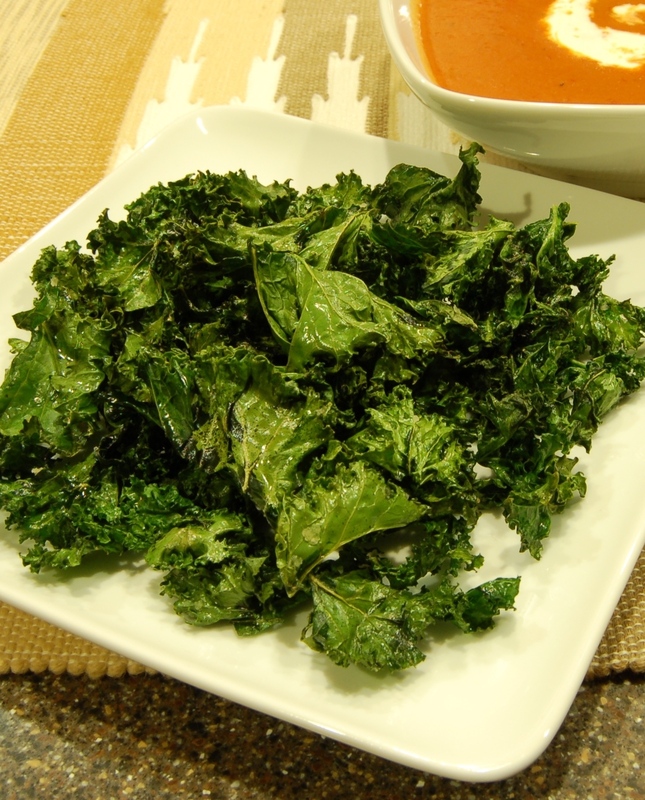 Kale chips make a wonderful, healthy alternative to potato chips for snacking. Oh — and baking really did crisp the leaves right up! I must admit to some misgivings as I had never baked kale leaves before but instead of getting soft and wilting like I was afraid they would, they turned light and crispy with a mild earthy flavor. You’ve got to try this recipe. Besides being super easy, it was absolutely delicious! I may never eat potato chips again! Wash and dry kale very well. Remove the ribs from the kale and cut leaves into 1½-inch pieces. Lay kale pieces on a baking sheet and toss with olive oil. Sprinkle lightly with salt. Be carerful! It’s very easy to over-salt the kale chips so go lightly on the salt in this step. You can always add more, but you can’t take away. No. 1 decided he was going to try the South Beach diet. In an effort to help him, I decided to make him a South Beach friendly breakfast. I found a recipe for these little mini frittatas on a site called Kalyn’s Kitchen and decided to give them a try. They turned out pretty good! They’re easy to do and make a great grab-and-go breakfast when you’re in a hurry. They make perfect little snacks, too. You can make them with egg substitute like I did, or use real eggs or even egg whites. You can also add a variety of meats and vegetables. It’s a very versatile recipe and the muffins are really tasty. When you’re pressed for time and rushing to get ready for work on a busy morning, it sure is a big help to be able to reach into the fridge and grab a couple of these for breakfast! Spray a 12-cup muffin pan with nonstick spray. In the bottom of the muffin cups layer diced meat, if using, vegetables, if using, cheese and green onions. Fill the muffin cups about 2/3 full, leaving room to pour a little egg around the other ingredients. 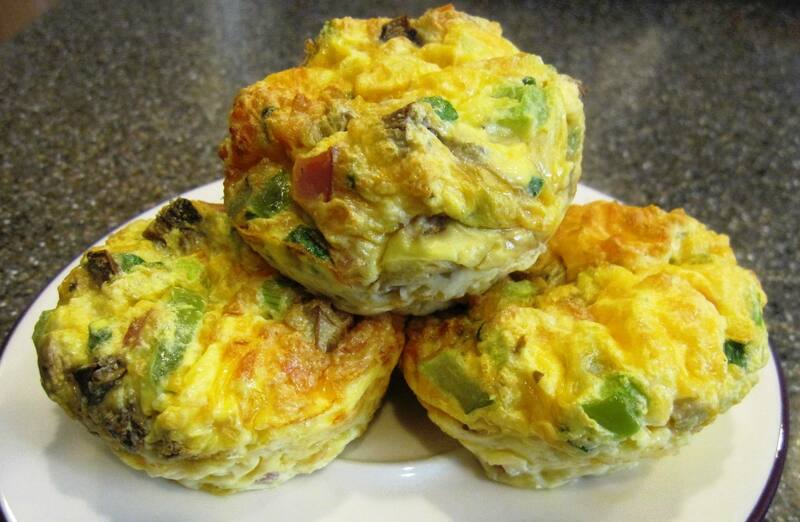 Pour egg substitute into each muffin cup until it is 3/4 full. Sprinkle with a little salt and stir slightly with a fork. Bake 25 minutes or until muffins have risen and are slightly browned and set. NOTE: Egg Muffins will keep for more than a week in the refrigerator without freezing. The muffins can be frozen and reheated in the microwave, but freezing makes them release water when they’re microwaved so it’s better if you can just keep them refrigerated.